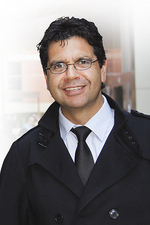 The University of Adelaide celebrates 25 years of Aboriginal education in 2012. The Adelaidean spoke to Professor Lester-Irabinna Rigney, the Dean of Wilto Yerlo, about the milestones in the last quarter of a century and the challenges that lie ahead. Q: What have been the major milestones in Aboriginal education at the University of Adelaide in the past 25 years? A: The University has grown a cohort of Aboriginal and Torres Strait Islander leaders that are the first in their fields in many cases. Since the appointment of the University's first Aboriginal Liaison Officer in 1987 to recruit more Indigenous students to tertiary study, a number of milestones have been achieved. These include Indigenous anthropology student Rebecca Richards making history in 2010 as Australia's first Aboriginal Rhodes Scholar, and the University's acknowledgment of the Kaurna people as original inhabitants of its land. Dylan Coleman, PhD Creative Writing graduate who in 2011 won the $20,000 Arts Queensland David Unaipon Award for an unpublished Indigenous writer. The establishment of a dedicated centre for Aboriginal education, Wilto Yerlo; the signing of the Reconciliation Statement in 2003 and the launching of an Aboriginal and Torres Strait Islander Employment Strategy in 2006 all stand as historic markers for the University. The Centre for Aboriginal Studies in Music (CASM) is also a major success story as it has produced very talented musicians who have embedded Indigenous knowledge into the music conservatory. Q: How has the University addressed the under-representation of Indigenous staff and students? A: Currently we have 24 Indigenous staff and 169 Indigenous students at the University. When you consider that the first Aboriginal to graduate from an Australian university was in 1969 - just 43 years ago - those numbers are extremely impressive. We have particularly had a lot of success recruiting Indigenous women as University staff members, although we still have a way to go to meet parity with the national Indigenous workforce participation rate of 2%. From a student perspective, Indigenous females also outnumber the males and are choosing diverse degrees, from medicine to nursing, health sciences, the humanities and social sciences. We are seeing increasing numbers of Indigenous students who are coming straight from school with strong Australian Tertiary Admission Ranks, many from regional areas. The growth in Indigenous scholarships at the University is also enabling many Aboriginal students to access higher education which was previously out of their reach. Areas we need to work on from both an Indigenous student and staff perspective are the maths, science and engineering disciplines. Q: How important is higher education in closing the inequality gap between Indigenous and non-Indigenous Australians? A: Universities and school transition to higher education are really important parts of the solution, particularly when it comes to addressing health and education inequalities. That is why it's so important to educate Indigenous health professionals and teachers who can go back to their communities after graduation and make a significant difference. Q: It's been almost 10 years since the University of Adelaide signed the Reconciliation Statement. How important has this been? A: The Reconciliation Statement is based on a need to embed and build Aboriginal perspectives into our curriculum and campus life, rather than "bolt" them on. I think we have made great strides in developing policies that are sensitive to Indigenous culture and practices. Much of this is due to the efforts of the Vice-Chancellor and President, Professor McWha, who has been a great champion of Indigenous peoples. It's important, however, that we do not rest on our laurels. Aboriginal education is the responsibility of everyone in the University, not just a select few.